This is the continuation of the historical photography project featuring images from the area around Garda and Tyrol, implemented over the years by the MAG, the Upper Garda Museum. Following on from the previous exhibition dedicated to Alessandro Oppi and to the Lotzes, on 13th April 2013 the Museum of Riva del Garda will host the show entitled "Alois Beer. 1900-1910. Panorami fotografici del Garda dalle collezioni del Kriegsarchiv di Vienna". As well as staging the exhibition, the Mag has decided to enhance its own photographic archive with a set dedicated specifically to Alois Beer, consisting of 350 digitalised images acquired from the Kriegsarchiv in Vienna, along with some 80 vintage prints. The Beer set in the Mag collection will also be featured in a catalogue explaining the historical background to the works, which will be published during the month of June 2013. The creation of the Alois Beer Collection at the Museum of Riva del Garda represents a major step forward in valorising the Museum’s photo archives, by virtue both of the considerable number of images purchased and their high quality. 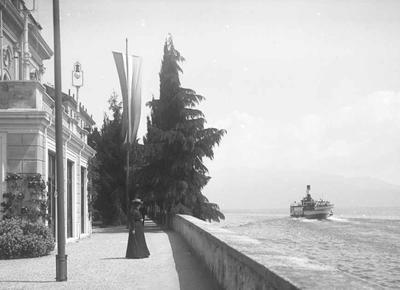 For the first time in a century, this exhibition presents the public with a genuine treasure: the original photographic studies of Lake Garda carried out by Alois Beer (1840-1916) which have resurfaced after more than 100 years since the images were taken. Hardly ever displayed before, the series of photographic negatives has been stored for all these years in the Kriegsarchiv collections in Vienna. The images, offering systematic documentation of the Garda area, were taken at the beginning of the 20th century, and to this day the series represents the largest photographic corpus produced by a single photographer known to exist. Alois Beer. 1900-1910. Panorami fotografici del Garda nelle collezioni del Kriegsarchiv di Vienna is an exhibition curated by Alberto Prandi. It will remain on show at the Museum of Riva del Garda from 14th April until 3rd November. The exhibition, promoted by the Mag Upper Garda Museum, is the continuation of the project dedicated to historic photography of the Garda and Tyrol area, developed by the MAG over recent years. The 350 images were shot by Alois Beer during one of his photography expeditions, with the aim of adding to his rich catalogue of photographs aimed at an Austro-Hungarian audience. When the Carinthian photographer travelled to Lake Garda, he already enjoyed considerable fame, and his studio in Klangenfurt was looked upon as one of the most prestigious of the day. His collections of landscapes and cityscapes featured a variety of subjects, which apart from all the key sites of the Austro-Hungarian Empire, also included images of towns and territories in Italy, France, Belgium, Spain, Greece, Egypt, Palestine, Turkey, Syria and North Africa. Through his panoramic views of Garda, Alois Beer seems to want to capture that sense of amazement felt by Goethe on first seeing the Lake, and appears to manifest the same need for empathetic participation in the imposing spectacle of nature that was an implicit part of Romantic culture. When he undertook his photographic campaign around Garda, Beer was already a seasoned traveller, yet his experience, confidence and familiarity with a vast range of different countries and peoples had not lessened that original curiosity which underpinned his gaze, nor his ability to offer a photographic rendering – with his own highly individual touch – of the naturalistic aspects of the Garda environment, emphasising the atmospheric phenomena, the perspectival nuances, the contrasts between the elements, without ever giving way to pictorialist inflections, however fashionable they were at the time. Alois Beer, born in Budapest to a Carinthian family, at only 23 years of age opened his own photography studio in Vienna, and shortly afterwards a branch in Kagenfurt to which he then moved, leaving the Viennese studio to his business partner Ferdinand Mayer, with whom he also opened a further branch in Graz. His ateliers were frequented by those who sought to have a photo-portrait taken by him, while his commitments in other fields also increased rapidly. He received commissions for documentary photographic campaigns, for example, of the new railway lines of the Empire, and in 1882 he was awarded the title of Photographer of the Imperial Royal Court, adding to the title he had already been given: Photographer of the Imperial Royal Navy. 1879 was a particularly decisive year for him: Beer published a photo reportage on the damage caused by a landslide to the Carinthian towns of Bleiberg and Hüttendorf and a few months later, he was endowed with the gold medal for art and science, thus rising to national fame. It was in this period that he began to extend his photographic repertoire beyond the Carinthian province. In 1885 he set out on his first important voyage, to Greece, to be followed over the years by those to Palestine and Egypt, North Africa, Turkey, Syria, France, Belgium, Spain and Italy, as well as shorter trips to various parts of the Austro-Hungarian Empire. The catalogue of images produced in his Studio came to host some 20,000 landscape images, a huge number for the day. He would sell these images near and far, also thanks to a network of sales correspondents throughout Europe. The Alois Beer photo archive, held at the Kriegsarchiv in Vienna, hosts the over 30,000 plates belonging to the photographer to be found in his sales catalogue, first published in 1910 and then updated in 1914.